Hi all, just wanted to do a quick post to share with you this awesome card that I won from the lovely Marika (Craftybit on youtube). 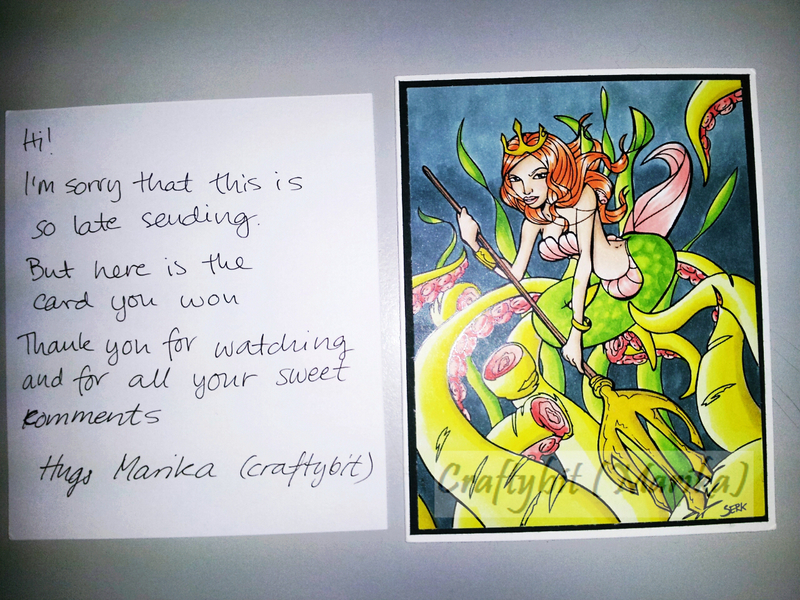 I was selected as a winner in a recent drawer and got to choose any card that she'd made to have for my very own. The card I chose is of a warrior mermaid. I just loved the fierceness of this warrior chick and also the colouring of the image and the background. Thanks for stopping by, I totally recommend that you check out Craftybit's channel if you have any interest in copic colouring, she's awesome! It's lovely Karen! Great you won it!! Yeah, it's fab! I just watched the video again too, then went and looked at the card in person, how cool is that! It's a gorgeous card, Karen! I love her videos, I always learn so much! So do I, she's so good at colouring and putting things together! Thanks Cheryl!